Captain Charles J. Vanmeter was named chancellor emeritus of WKU. His home was used for the Southern Normal School and buildings at both WKU and the Bowling Green Business University were named for him. His obituary from the Confederate Veteran, Vol. 21, March 1913 follows. Capt. Charles J. Vanmeter, who died recently at his home, in Bowling Green, Ky., was a man widely known for his broad-minded philanthropy. He was one of the oldest, if not the oldest, of the native citizens of Bowling Green. 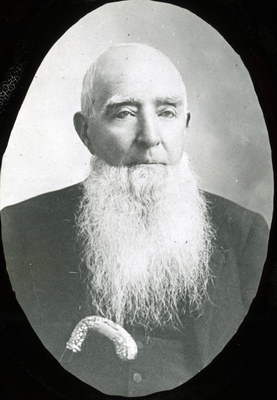 After being educated in the schools of his native town, Captain Vanmeter began life as a clerk under his father. Soon becoming tired of a mercantile life, he went to and conducted one of his father's farms. In 1886, together with his brother and Captain Leiter, he built a steamboat. On its maiden trip the boat was frozen up at Carrollton for seven weeks. But the business soon became a very remunerative one, Captain Vanmeter having charge of the office in Bowling Green. The business grew, and subsequently the Bowling Green Navigation Company was formed. This old company is well remembred by the older citizens, and they often speak of that period as the halcyon days of the city. Captain Vanmeter had been living a retired life for a number of years. He was much interested in educational work, and it was through his generosity that old Vanmeter Hall at the former Normal school was made a possibility, he furnishing the funds for its erection. When the State took charge of the school and bought the Potter College property and erected a handsome, stately building, it was named in his honor. It is one of the most substantial buildings in the State. In all public enterprises Captain Vanmeter had always been a leader, and many projects through his untiring energies have been made possibilities.